The central cholinergic system is implicated in cognitive functioning. The dysfunction of this system is expressed in many diseases like Alzheimer's disease, dementia of Lewy body, Parkinson's disease and vascular dementia. In recent animal studies, it was found that selective cholinergic modulation affects visuospatial processes even more than memory function. In the current study, we tried to replicate those findings. 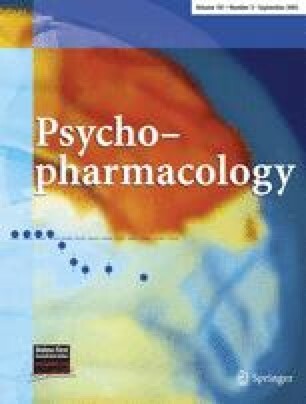 In order to investigate the acute effects of cholinergic drugs on memory and visuospatial functions, a selective anticholinergic drug, biperiden, was compared to a selective acetylcholinesterase-inhibiting drug, rivastigmine, in healthy elderly subjects. A double-blind, placebo-controlled, randomised, cross-over study was performed in 16 healthy, elderly volunteers (eight men, eight women; mean age 66.1, SD 4.46 years). All subjects received biperiden (2 mg), rivastigmine (3 mg) and placebo with an interval of 7 days between them. Testing took place 1 h after drug intake (which was around T max for both drugs). Subjects were presented with tests for episodic memory (wordlist and picture memory), working memory tasks (N-back, symbol recall) and motor learning (maze task, pursuit rotor). Visuospatial abilities were assessed by tests with high visual scanning components (tangled lines and Symbol Digit Substitution Test). Episodic memory was impaired by biperiden. Rivastigmine impaired recognition parts of the episodic memory performance. Working memory was non-significantly impaired by biperiden and not affected by rivastigmine. Motor learning as well as visuospatial processes were impaired by biperiden and improved by rivastigmine. These results implicate acetylcholine as a modulator not only of memory but also of visuospatial abilities. Funding was provided by NV Organon. We would like to thank them for their financial and technical support to perform this study. We would also like to thank Jan Leijtens and Drs. Sevla Cinar for their helpful assistance in data collection and analysis. This experiment complies with the current laws of the Netherlands.